If you look at the September 2000 110 MPH results, you will see that if we in car 246 improved our timing by only 73 milliseconds (that's less than one-tenth of a second) we would have come in second place rather than fourth. I built a mock-up of three lights and set them up with solid-state relays for 5V remote control. Then, using simple TTL logic, I built a sequencer to control the lights. I then took a 1 KHz standard and gated it through a diode switch run from the control voltage to the last (green) light. I put a normally-closed pushbutton in series with the diode gate voltage. The output of the gate then goes to the frequency counter, set up as an event counter. The net result is that the counter counts milliseconds, starting when the green light comes on and stops when I press the pushbutton. The counter then reports the time interval between when power is applied to the green light and when I push the button, which is a substitute for the stop watch start button. Did I learn anything from this experiment? Yes. I learned that my reaction time isn't that good! Will this help? I hope so. Want to build one for yourself? 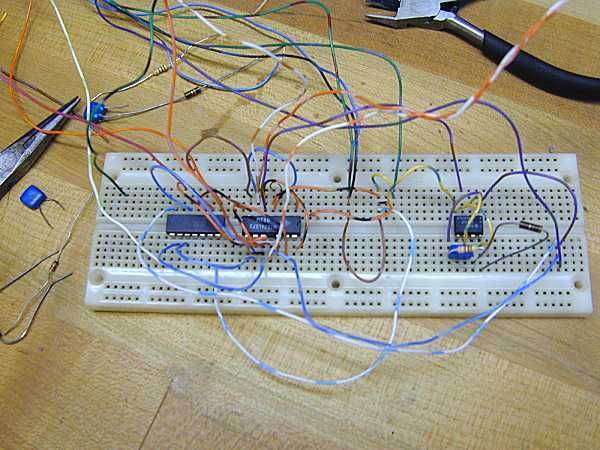 Here's a picture of the simple TTL circuit. That's a 555 timer on the right, a dual J-K flip flop and a quad NAND gate. Much better than a schematic, don't you think?